The answer, of course, is oh my word yes am I actually here wow okay lovely ummm that’s stunning. Don’t worry. Even though it might feel a bit surreal, I am perfectly aware that I have arrived! and I have the jet lag to prove it. Ha. 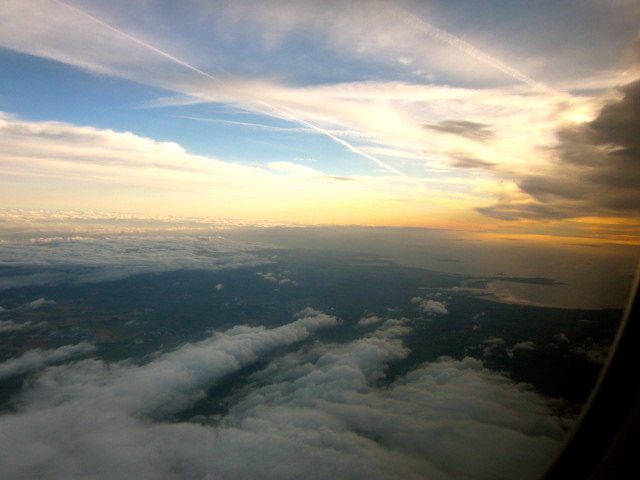 The flight over — my first trans-Atlantic! how exciting — went quite smoothly. That is largely due to my uncle, who bought my tickets — bless you, Uncle David, for your generosity and for getting me window seats. I am staying the next few days with friends of friends, Ann and Kenny. Ann’s Irish, Kenny’s Scottish, and the two of them are absolutely delightful! I took a quick nap at their place, then headed out to try my hand at getting to and around the city. I made it! The bus system is fairly easy to navigate, and once I was in Dublin I commenced to walking around as much as I could for the next few hours. I walked up and down the Quays (which, as I’m sure my family will be amused to learn, I had trouble pronouncing. I’d assumed it was said “kway,” but it isn’t; it’s like “key”! ), down by College Green, all around O’Connell street at least two or three times, and spent a good bit of time on some of the side streets, too: enough, at least, to discover a number of wonderful bookshops and to find the Bubble Tea Shop. I also found the Central Post Office, which, by the by, contains a museum and is organized by what you might be there to do. That is, there’s a section for buying stamps, a section for paying bills, a section for welfare/related things, a section for mailing packages, etc. It was all impeccably efficient! One of my favorite parts of today, though, was figuring out the buses (at least between Leixlip and City Centre). My ride over was slightly hassled: I didn’t know how much the fare would be, how to pay, where to get off, etc. My ride back, however, was the epitome of ease. 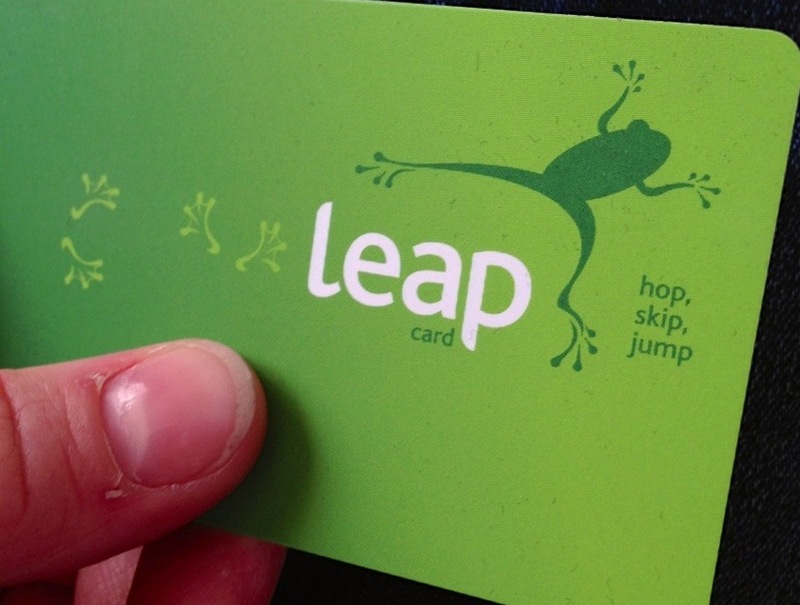 I found the bus office during my trips around O’Connell Street and purchased a leap card — it’s like a MetroCard… for Dublin! They even gave me a neat little plastic card holder with it. I sat on the upper level (most of the Dublin Buses are double-deckers) and stared out the window until we reached my stop. A precious little girl, probably about six, sat across the aisle from me with her grandfather. Attempts to not be tourist-y aside, I really like it here. Granted, I’ve only been here for, oh, 15 hours or so. I’ve learned much, and know there is more to come; I’m excited to see what’s next! Plus, I’ve already had someone ask me for directions. … No, seriously. 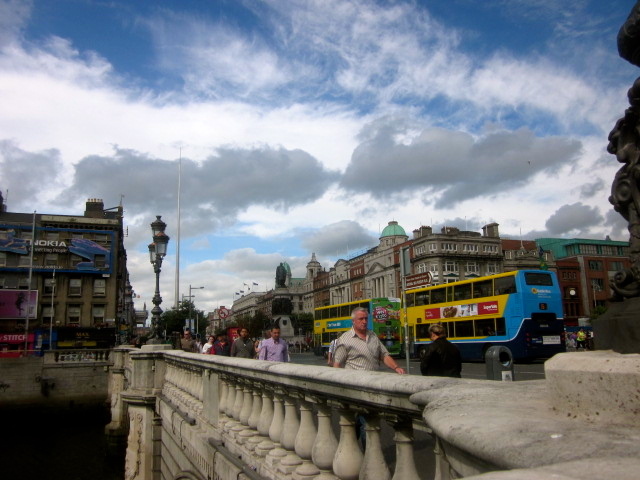 I’d been in Dublin for all of 30 minutes when somebody asked the way to Trinity College Dublin. Thankfully, I’d just walked past it! Other curious sights: a boy dashing across the street in an old Georgia Tech sweatshirt; a bridge with lots of locks on it; a pre-school painted like a puzzle; a building that looks like Gringotts; street art that made me sigh because why can’t people in Philly do this? ; the Monument of Light (or Spire of Dublin); a tattoo parlor called “Cru Tattoo” (although I doubt any of my friends from Cru wit tattoos got theres from said parlor); a whole handful or two of small bookstores that I did not enter — they’re everywhere; people casually kayaking down the River Liffey… the list goes on. And now, a brief vocabulary lesson. Earl Grey on the plane; Basia’s magic black tea after my nap; lemon ginger to finish a busy day. I’ll close this as many things should be handled: with tea. This entry was posted in a semester abroad and tagged amusing adventures, dublin, ireland, study abroad, tea by connor grace. Bookmark the permalink. You will often see a bridge in most European cities with locks on it. Two people in love will put a lock on the bridge to signify/seal their relationship. It’s kind of romantic. Enjoy your time! THE MAGIC TEA. Now I feel like I must go brew some. 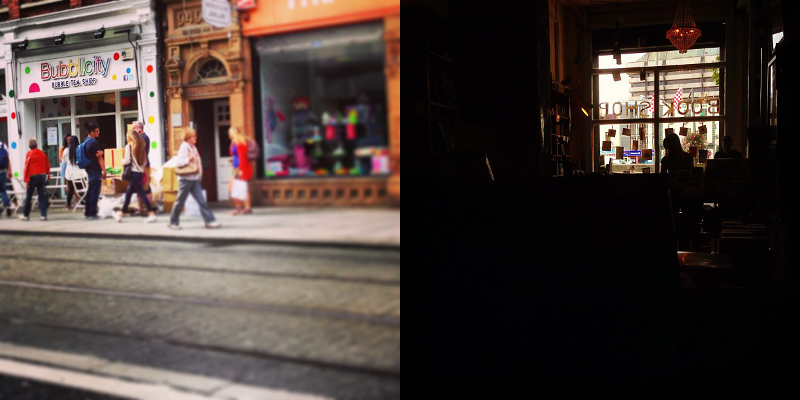 Also, why can’t Philly be like Dublin and have cute little bookshops all over?